His second great love is painting and even now when he walks his dog, he is taken with the dynamic color and form of the cracks and missing pieces of the sidewalk. Like music, its purity is in relationships. The forms and colors are arranged to express your inner feelings and emotions and thoughts. Meditation, however, is object-less. His parents were a-spiritual. It was seeing a picture of rabbis on the back cover of Life magazine as a child that sparked a desire to know more. He was 25 before he actually investigated. It was through this investigation that he began reading the Tales of the Hasidim by Martin Buber. He was also inspired by the Platform of the Sutra of the Sixth Patriarch at this time. When friends suggested he visit the Zen Temple in San Francisco to hear Suzuki Roshi teach, he went. Feeling that he was unable to find a “spiritual” rabbi, he found the qualities he was searching for in Roshi. Roshi was being what he was teaching. From the Hasidic ideal, Abbot Weitsman learned to just be yourself. Don’t use the practice to get ahead. Don’t seek enlightenment because it is already there. You don’t have to worry about it. Enlightenment is not such a big deal. What’s difficult is maintaining your practice. Meditation is letting everything come up and then letting it go. It’s like dropping. Let everything drop and what doesn't drop is yours. Let go of what prevents you from seeing you are enlightened. He wanted to have a practice that was log-less, like painting. Painting had been his life and then Zen became his life. As opposed to watching the ocean as he fished as a child or being immersed in painting or focusing on an object as a friend taught him later, zazen is sitting cross-legged and the main thing is good posture. It is to have really good posture and sit up straight and hold your hands in a certain mudra. The whole thing is a mudra, and the point is to find the ease within the effort. It is the effort to sit up straight and then letting go and finding the ease within the form of how you sit. You let your thoughts come and let them go without attachment. Good structure and ease is a way to live your life. The main focus of posture is support for the breath. Letting the breath come and go easily without controlling it. Finding your ease within your breath. Breath is life. When you inhale, inhaling is inspiration. Exhaling is expiration. When you inhale you come to life. When you exhale you let go. You experience birth and death with each breath. Life includes both birth and death. The beginning is the end of something and the ending is the beginning. Zazen is the teacher. You have to stay there and experience everything that comes. If you experience painfulness, how do you deal with that because life is pain? It isn’t a journey because a journey goes somewhere. It is going deeper into your true self. It is letting go and inspiring yourself. It is like playing music. The more you play, the more you understand and the more interesting it becomes so the more insights you have. As you go deeper, you get more jewels, more gold. Practice is not just sitting, but also activity. You express your practice in your daily life activities. One side is just as important as the other. The two sides have to be worked together as one. You take your quiet empty side into your daily practice and the activity is within your still side. So, stillness and activity are the same regardless of what you are doing. Zazen is what we’re doing all the time. Practice is about not being self-centered. The activity of wisdom is compassion. Whatever the tone of the country or the world, your practice doesn’t change. It’s just dedicated to acting in a compassionate way toward the world. Mind has many different meanings. Instead of talking about Deity, we use the term Mind. Big Mind is like Universal Mind. Small Mind is the individual mind which includes ego and personality and self. We talk about selflessness, but it goes further. We use the term emptiness, which people don’t quite understand. Think of emptiness as interdependence. There’s nothing that exists by itself. Everything exists dependently on everything else, which is why we don’t talk about Deity. Zen has no quarrel with science. Science expresses itself in terms we use in Buddhism. When we sit in zazen we resume our Big Mind nature, true nature. When you take a step back you uncover your mind. When your practice is mature, there’s no difference in when you’re sitting and walking. It is to have a calm mind no matter what’s happening. When you sit for a little while you like to move. When you sit you become uncomfortable. You have to find from the inside how to open up to whatever is there. As soon as you start shutting down, you have a problem. When you see that anything is an intrusion, you have a problem. Pain, as long as you don’t discriminate it, as soon as you don’t like it or don’t want it, is suffering. The cause of suffering is when you have pain and you don’t like or want it. How to properly discriminate is a big problem in life and in meditation. Zazen is our great teacher because it teaches us how to have a calm mind in all circumstances and to accept and face whatever is in front of us and happening to us. You don’t take anything. The teaching in ongoing. Teaching is a hint about how to find something within yourself. You can only put so much information into a person and so the best way is not to say anything. Just show them and let them find it within. For example, if you push someone off the bridge and they land in the water, they have to learn to swim. So, it isn’t about information, but putting them in a position and finding their way out. You teach a person not to ignore what’s in front of them. There’s something called identification. Compassion means to identify with. Passion means suffering. Indifference is ignoring something. You should teach a person not to ignore what’s in front of them. Indifference is to not identify, which is like cutting off part of oneself. To identify with others is to identify with one’s self. Everybody should be thinking of how to keep the practice pure. It is important to consider so that we are always upright, so that we keep balanced, keep our minds and activities balanced. We set boundaries. Sometimes boundaries are flexible. We use precepts, rules of behavior. We need to not be attached to a rule. For example, don’t kill. That’s not possible. Life is devouring itself. Life is giving itself to itself. Sometimes precepts are not easy to understand. When you eat something, you are taking life. If you say a blessing or an acknowledgment to the food you are eating, it’s different. It becomes sacred. 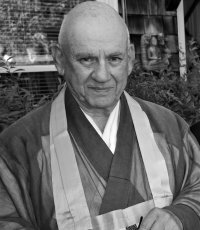 You can learn more about Abbot Weitsman’s work on his page at the Berkely Zen Center website or listen to his lectures, classes and dharma talks here.